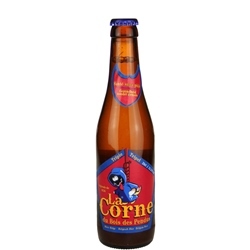 La Corne Triple (ABV 10%) from Brasserie d'Ébly pours a rich, almost coppery blond with a long-lasting, billowy, frothy white head that leaves delicate lacing. Initially, its fragrant, floral, spicy aroma recalls honeysuckle and white pepper, but underlying this are grounding notes of fresh-baked bread and golden malt. Made without added sugar or spices, its taste is smooth and rich, with a hearty grain sweetness balanced by herbal bitterness, citrus notes, and a little acidity. Medium bodied with a dry finish, and some warmth from the considerable alcohol. Ratebeer.com rating: 86 (out of 100)! 11.2 oz bottle. In 1636, in the middle of the 30 Years War, a group of mercenaries were trying to make their way west into France to stir up trouble and kill some Frenchmen. Local Belgian villagers, unable to convince them that they were not French, and recognizing they were ill equipped to defeat their unwelcome guests, retreated into the nearby Anlier Forest. The mercenaries captured 100 men, women, and children and marched them to the edge of the forest in an area where the trees formed a horn and proceeded to hang them all. There is a local legend that among those who met their fate that day was a master brewer named Cornelius. As the mercenaries drew near he knew his time was short, so he took his final moments to write down his recipes and methods and buried them in the woods. The brewers at Brasserie d'Ebly have done Cornelius proud with the recipes they've developed, and until the day when Cornelius's recipes are found again, beer lovers can raise a La Corne in a Horn in honor and memory. 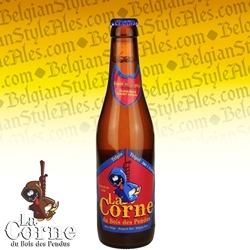 The brand name "La Corne du Bois des Pendus" loosely translates to "The Horn of the Woods of the Hanged".